General Hammond abruptly resigns from the SGC, and is replaced by General Bauer, who promptly dismantles SG-1, reassigning the team members and placing O'Neill on temporary leave. O'Neill suspects that there is more to Hammond's sudden decision than he is saying, and an investigation reveals that he is right. Powers within the NID were behind the change of command, resorting to blackmail to remove Hammond, in order to force a more aggressive approach toward acquiring alien technology. General Bauer's first project is to assign Carter the task of building a naquadah-enhanced nuclear weapon. Despite her warnings of the devastating chain reaction such a device could cause, a prototype is developed and tested off-world. The destructive power is enormous, and begins to translate back through the gate, posing a threat to Earth, until the gate can finally be disengaged. Meanwhile, O'Neill begins an investigation into the powers behind the NID, and he turns for help to an unlikely source: Colonel Maybourne, who has been serving time in prison for treason. In exchange for temporary release from prison, Maybourne agrees to use his contacts to assist O'Neill. Their investigation through a covert chain of command leads to Senator Kinsey and the very highest echelons of political power. A confrontation with Kinsey reveals only the tip of the iceberg of a conspiracy that reaches far beyond the NID itself. However, the evidence they uncover from Kinsey's own computer sets the wheels in motion to restore Hammond's command, and also provides Maybourne with an opportunity to guarantee his freedom. When the SGC shut down off-world operation of the second stargate, it cut off the NID's access to alien technology. Maybourne was sent to work for the Russians, and the Pentagon forced the Russians to close their stargate in exchange for continued sharing of information and technology. The US has the only operational gate. Two weeks earlier, representatives of the NID suggested that Hammond take a more aggressive approach to gaining access to off-world technology, and threatened consequences. The next day, two men in plain clothes and an unmarked car picked up his granddaughters from school before bringing them home. Hammond resigned. The NID is made up of cells that communicate with each other by accessing bulletin boards online using firewall protected servers, decoding software, and passwords. 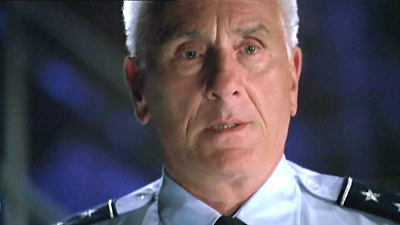 General Bauer reassigned SG-1. Carter was assigned to develop a naquadah-enhanced nuclear weapon. Daniel was given a desk job as a consultant, going off-world only as required. Teal'c was assigned to SG-3. O'Neill was given leave. P3S-452 is a Goa'uld stronghold rich in naquadah. A strike force mission to the planet obtained naquadah to be used in the bomb, but was met with heavy resistance. Lieutenant Morrison was wounded, and Major Wade killed. A stargate can survive a direct hit from a meteorite or nuclear blast. An energy source at the destination can keep a gate active beyond 38 minutes, and radiation, gravitational effects, and time distortion can translate back through an outgoing wormhole. The naquadah bomb was magnified by naquadah in the soil of the test site planet, and it sent ultra high frequency gamma rays back through the gate. Maybourne was convicted of treason and is facing the death penalty, prisoner number S2989. O'Neill and the President "go way back." His connection granted Maybourne's release for a few days in exchange for his help in obtaining proof of influential people's involvement with the NID. Senator Kinsey's online activities connect him to NID actions over the last year and a half, including Maybourne's secret operation out of Area 51, involvement with the Russians, and the threats to Hammond. Maybourne emailed himself a copy of the incriminating evidence, and used it to pressure Kinsey into transferring him to another facility, from which he could escape to the Caribbean. Charles Bliss is one of a hundred names that Maybourne uses. On the "Findorama.net" bulletin board, he logged in with the username "Menard" (also the SG-1 Director of Photography). Zoë makes her screen debut as "Oscar." Good afternoon, Ma'am. I'm Starsky. This is... Hutch.